We are in the aftermath of the Portuguese local elections, nonetheless, our attention is already being needed for one of the major decisions at the country level: the Portuguese Government Budget (OE). Approximately one month separate us from the start of the discussion on the topic. So, in this article, I will recall one of the main debates around the first Budget of the current mandate: the shift in weight of direct taxes towards indirect taxes. The point I will be making is that 1) this change was likely perceived by citizens as a decrease in total taxes paid; 2) the substitutions of revenue from income taxes to consumption taxes decreased the overall distortion of the tax system; 3) the opinion I present in the previous point can also be corroborated by citizens feelings of fairness towards the tax they pay. Hence, this article is presented as food for thought as little (and quite ambiguous to attain) evidence exists. On the discussion of the OE 2017, one of the main arguments by the opposition for the shift in tax nature, was that it would make the system less progressive. In other words, the government would be substituting a direct tax rate that is higher for the rich and lower for the poor, for an indirect tax that is the same for everyone and people only pay more if they consume more. In this article, we will disregard equity considerations and historical trends of economic variables, namely GDP which influences the tax burden measure (tax revenue divided by GDP), and focus on the public perception of the tax (assumed to be positively correlated with the distortionary power). This said, what happened in those years was that even though the tax revenue increased, public opinion seemed to be of approval of the lower income tax, ignoring taxation on products (indirect taxation). In my opinion, there are two strong arguments to explain this acceptance rate. First, a lesser perception of the taxes which started to be hidden in the price of products and not well discriminated as in the difference between the gross and net salary. Important to notice that consumers’ perception of increases in price has many flaws, which reinforces why people will ignore the indirect tax. Secondly, considering people were not happy with the policies at the time, one can argue that income tax that people believed it would turn into erroneously spent government revenue was substituted by different consumption taxes pursuing objectives people could connect to, such as, tax on sugar, on cigarettes or pollution. This shift may induce more support for government spending reducing tax aversion by citizens as defended by Listokin and Schizer, professors at Yale and Columbia Law Schools, respectively. To conclude, the decision on taxes of the OE 2017, disregarding equity considerations seemed to be popular, what in the context of the current politics was determinant to win the confidence of the Portuguese taxpayer. Categories: Economics, Taxes | Permalink. Since early 70’ Italian citizens have been suffering from one of the highest gasoline cost of the entire world and, after the powerful earthquake that hit the central region of the country one month ago, a new rise in the excise taxes on oil is considered almost sure by many opinion makers. Compared with Germany and France, the major European economies, Italian gasoline’s cost for consumers is 10.7% greater: 1.31€/l for both German and French people versus 1.45€/l for Italians (data from http://www.GlobalPetrolPrices.com are referred to the 20th June-26th September 2016 period on a weekly basis). Such a high level in oil price is due to a fierce taxation system, mainly on the excise side. Nowadays, the Italian excise duty for leaded petrol product accounts for 0,7284€ per liter according to EY “2016 Global oil and gas tax guide”. Throughout Italian history, governments have used the excise on oil to collect money, easily and rapidly, in order to cope with exceptional circumstances or natural calamities or wars, too. For instance, taxpayers are still paying excise for the Ethiopia campaign of 1935. On one hand, oil producers, who bear legally the excise, face no troubles in shifting the tax burden to gasoline users. On the other side, Italian consumers can hardly subtract themselves from this huge excise incidence. In fact, oil is Italy’s most important energy source (according to http://www.statista.com). A possible explanation on this inelastic demand may rely on the inefficient infrastructures and transportation systems. Looking at OECD 2015 data, Italian investments in inland infrastructure, a key determinant of performance in the transport sector which include both spending on new transport construction and the improvement of the existing network, is only 0,40% of the GDP. This data is consistently low comparing to the 1% on the total GDP spent in a country as France, and to the German expenditure over GDP, which is around 0,60% (source: http://www.data.oecd.org). Thus, when a new excise is introduced, consumers who use gasoline to reach their work place by car, could barely change their behaviour and start using an alternative mean of transport, like train, bus or metro. Perhaps those citizens who reside in metropolitan city, namely Milan and Rome, will start going to work with bicycle if there would be cozy and safe cycle paths developed as in Netherlands. Again, the main concern for Italians is a lack of substitution effect which could break up this stuck situation. Focusing the attention on a long-term perspective, Italy 2015 investment level in renewables has been 33% less than German level (source: http://www.data.oecd.org) and the trend is steepening in the last three years. Nonetheless Italian investments in renewable sector is, quite surprisingly, the second one regarding the European Union, slightly higher than Sweden. So if Italian governments will do the necessary investments in both infrastructures and renewables, the next generations might be able to quit from the gasoline puzzle and, who knows, maybe excise duties on petrol will be used in a better way: as incentive to choose the “green way” in spite of polluted one, no more to raise money quickly. Categories: Economics, Efficiency, Taxes | Permalink. Social Security is financed through contributions (SSC), in the form of payroll taxes. At an average of 9% of GDP in 2012, these are a significant part of the economy. Contributions are paid by both employers (paying the majority, at 5.1% of GDP in 2012) and employees (3.3%). These affect the labour market. Labour supply (SL) shifts upwards and becomes steeper, as workers compensate for taxation with a proportional rise in their reservation wages. Labour demand (SD) also contracts as the marginal cost of labour rises. 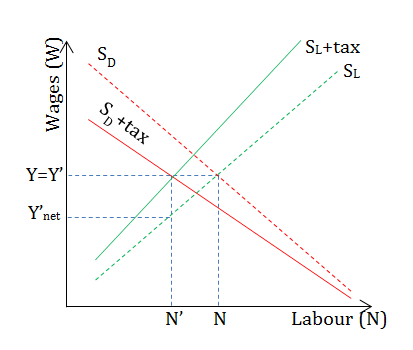 This distortion in the labour market, illustrated diagrammatically, causes a reduction in the equilibrium quantity of labour (N to N’). Its effect on wages is (partially) supported by Saez et al. (2013) – earnings stay constant (Y=Y’) but net earnings fall (Y>Y’net). This has led to its political characterisation as a ‘jobs tax’, accused of slowing job growth. This is predicted by theory – the employer not only needs to afford the worker’s wage, but also the social security contributions that come with hiring them. For this reason, a reduction in the employer SSCs was included as part of Portugal’s structural adjustment programme. In 2011, several options were studied, from a general tax cut to sector-specific or new-job-exclusive cuts. In September 2012, the government proposed (and in the face of the largest protests since the revolution, abandoned) a policy of lowering the employer rate and raising the employee rate, with a net increase in contributions. Portugal was not the only country where payroll taxes were reformed. Between 2011 and 2013, the United States implemented a payroll tax ‘holiday’ (which was really a temporary cut). During 2010, there was also an exemption for employers who hired unemployed workers. These temporary tax breaks, however, do not address SSC’s labour market distortion in a permanent way. This issue has been addressed in the manifestos of Portugal’s 2 main parties, PS and PSD/CDS (PàF). Space does not allow a discussion of PàF’s Bush-like ‘privatization‘ plans. Portugal’s PS proposes a temporary break in employee rates (p. 11), hoping to correct the post-crisis hysteretical contraction in output and employment that has compromised Social Security solvency so. They innovate, though, in two proposals: one proposing discriminated employer SSC rates, rising with staff turnover (p. 33-4), and another in proposing a replacement of 4% in employer’s SSCs with a consignment from corporation tax (ibid, p. 43-4). This diversification of social security financing will represent a net saving for most firms, particularly for labour-intensive sectors who paid a larger share of their revenue in wages and so payroll taxes. Portugal specialised in many of these labour-intensive sectors (cf Mamede 2015) and these have been some of the most hit by the crisis and austerity – e.g. construction and restaurants. This policy is therefore targeted for maximum stimulus. However, research tells us economic development comes from capital-intensive growth outpacing labour-intensive growth. This, indeed, has been the development strategy of previous Socialist governments, which suggests PS’ policy innovators still have some fine-tuning to do to maximize growth as well as stimulus. After all, only growth can really secure sustainability. As described in detail by Andrew Schotter (79), tipping is a social convention with economic value. In this comment, I intend to give a brief explanation of the economic gains from this institution and then, in the line of my previous post, present its cost, namely its tax implication. Whenever regulating the exchange of otherwise trivial services (such as haircuts, meals, etc) would involve negotiating and writing excessively long and costly contracts between client and performer, tipping, by allowing variable compensation that rewards quality, comes on its own by avoiding these high transaction costs. For example, when entering a restaurant, it is neither feasible nor cost-effective to design and enforce a contract specifying unambiguously all the conditions of the deal (how many (and how tasty) french fries will be served, the gentleness of the waiter, the quality of the glasses and cutlery, etc). So, except for some characteristics (namely sanitary and safety conditions) that are regulated, we are unsure about the food and the quality of the service we will receive -and because there is no contract, there is no way of litigation either. However, if tipping is instituted (i.e. the waiter expects it and I feel bound to tip if satisfied) there is less need for the extensive contract because both parties implicitly agree that a fixed part of the meal cost will be paid in any case but that the other, the tip, will vary according to the client’s level of satisfaction. In the case of dissatisfaction, the client simply does not tip or pays a smaller tip (and usually does not look for further recrimination). Conversely, the waiter expects to be rewarded for good service. Furthermore, tipping is an efficient mechanism for the allocation of workers as it promotes self-selection. Again, in the restaurant industry, because of information asymmetries, the employers cannot really be certain of each applicant’s abilities at the moment of hiring. However, setting a payment system consisting of a fixed wage plus a variable component (the tips collected), will dissuade bad waiters from applying, as they know they won’t be able to collect tips enough to cover equal their opportunity wage. On the contrary, good waiters will be keen to accept those jobs, as they know they will receive lots of tips. So, we conclude tipping is in fact advantageous for the satisfaction of multiple parties in the economy and that it contributes towards efficiency. However, tipping comes at a cost too! Following my previous comment on the possible decrease of the VAT for the restaurant sector, we can also identify another advantage of restaurants over similar businesses: tips are not taxed! Clearly, if tipping allows for lower prices (as part of the service cost varies according to the client’s satisfaction, and is only paid after the issuance of receipts) then it is reducing the base for VAT, especially when the waiter service is a major part of the added-valued of restaurants. But this does not end here: restaurant owners also pay lower IRS, (tax on income), on behalf of the waiter since this amount is calculated taking into consideration the fixed part of the wage alone. Similarly, lower contributions to social security are paid. Then, if tipping reduces the amounts of all three taxes paid by restaurants, on top of their known ease of evading taxes (they merely have to declare stocks as having expired), we clearly observe an unfair advantage over similar businesses, namely those who compete for the same workforce but where there is typically no tipping (for instance, shop sales staff: identically not well-qualified but not tipped for their services). This tells us that the real VAT rate restaurants pay is in fact lower and further justifies the previous argument that lowering the VAT for restaurants only is conceding an unfair rent. Moreover, if we say that, with the present crisis, tipping rates fell (as consumers try to cut spending to minimums), the unemployment increase in the sector cannot be fully explained by the increase in VAT that occurred in 2011. As tips fell, some waiters left their jobs or demanded higher fixed compensations; this may have led to the closure of many restaurants whose service quality deteriorated or who could not afford higher costs. So, the impact of lowering VAT as proposed by the government will probably be even smaller. From another perspective, we can look at tipping as an adjustment factor that allowed restaurants not to dismiss employees. After the VAT increase, people knew they had to keep paying tips as long as they were interested in maintaining the previous service quality level (this may be plausible if we believe that the number of employees per restaurant did not decrease much, in this case unemployment is mainly explained by the full closure of many restaurants). Categories: Economics, Efficiency, Microeconomic Policy Analysis, Taxes | Permalink. In Portugal, on January 1 2012, VAT on restaurants, bars and cafes rose to 23%. The Government’s intention was clear: raising fiscal revenue. At the end of the year, results were out: an 109% increase in fiscal revenue from the sector (€521 million for 2012). However, a large share of the additional revenue results from stronger fiscal control. Now Government is considering cutting the rate back to 13%. This time, the argument is that the decrease in the tax rate will act as a favorable stimulus to the short-term creation of jobs particularly effective for the younger workers who face the highest unemployment rate. Unemployment is indeed a concern in the sector: according to INE, in 2012, the number of unemployed people with origin in the restaurant sector increased by around 7.800, adding to the total observed number in 2011 of 55.565 individuals. In 2013, the figure increased even further, although at a lower rate. When VAT went up, from 13% to 23% (77% increase! ), prices were expected to increase similarly. But, checking the CPI for 2012, the true price increase from dec2011 to dec2012 in restaurants, cafes and similar services was only 1,35%. So, it is reasonable to conclude that the added VAT was paid out of restaurant’s margins and not from consumer’s pockets. As demand for restaurant services is very elastic (meals-out are easily substituted by doing-it-yourself), restaurants were probably afraid that passing the tax burden to their customers would lead to a very large drop in demanded quantity (already low due to recession and low available income) and absorbed it themselves. As VAT is an AdValorem tax on the producer, a change in the tax rate causes a pivotal shift in the supply curve. 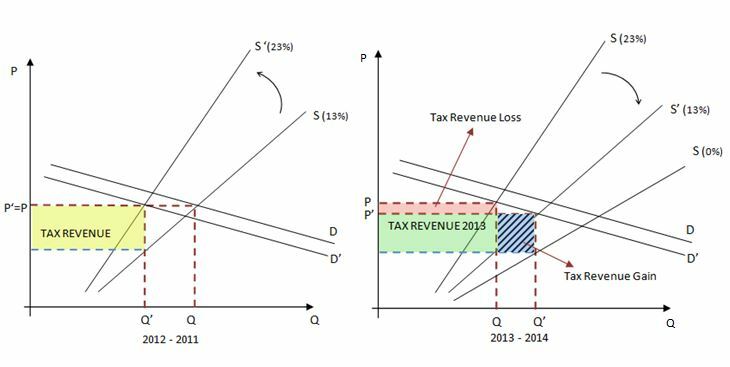 In the left graph, contraction in demand is assumed and, the new tax revenue of 2012 is shown, as well as the maintenance of prices. In right graph, tax revenue for 2013 is given by Q´ (where S’ (VAT=13%) meats D´) times the (equilibrium price-willingness to sell Q´ at S(VAT=0%). The price fall consequent to IVA drop is small – unfortunately no comments can be made on the exact size of final tax revenue impact, as it depends the proportion of Q and P changes . There is empirical evidence that VAT changes on restaurant services are only partially reflected on the market price (i.e. in 2009 France restaurant VAT fell from 19,5% to 5,5% but restaurant prices decreased by no more than 1.1%). In Portugal, a Trade Association already stated that prices will not go down -hence there will be no “boost in demand” and restaurants maybe actually gaining profits unfairly, “a rent”, when compared to other firms. Additionally, as restaurants are prone to tax evasion, and in spite of supervision tightening up, they may still be benefiting from a “real VAT” lower than other sectors firms. Furthermore, it does not seem very likely that the tax decrease will allow for any relevant increase in employment of the low-skilled workers of the sector as firms claim they are near the shut-down point. And there may even be the case where each job created will represent an unjustifiably high cost for the public finances (as occurred in France’s VAT cut of 2009 where each job generated came at a cost of €120.000 1). Finally, Government favoring restaurants over similar businesses that use the same workforce, may end up causing distortions in the labor market. Government may be keen on introducing some alleviating measures, as an answer to political pressures or to sustain the expectations that “the crisis and is almost over”, but isn’t the expected liquid revenue loss of 50 to 100 million€, immediately after the end of the External Assistance Program, a little too much? 1 – Sénate, La TVA à taux réduit dans la restauration: une mesure qui fait ses preuves. Categories: Economics, Microeconomic Policy Analysis, Taxes | Permalink. Oh, you think tax havens are good for the economy? Watching the video of the Center for Freedom and Prosperity on „Why tax havens are good for the global economy“ http://www.youtube.com/watch?v=yi0lkJBTi58, I, after taking a course in Public Economics, was quite shocked that it even is possible to claim a ‘scientific’ linkage between the economic performance since the 1970s and the existence of tax havens. I got quickly suspicious of how the narrator was quoting reports and research papers on the issue of tax havens and tax competition. The main trick, in my view, is that tax competition is sold as being exactly the same thing as setting a framework for tax evasion. The OECD is mentioned as the penitent bureaucracy which admits that „the ability to choose the location of economic activity offsets shortcomings in government budgeting processes, limiting a tendency to spend and tax excessively“http://www.oecd.org/eco/outlook/2088806.pdf. However, this citation is clearly taken out of the context, presented in a way that fits the Center’s objective. In the OECD’s report on „Forces shaping tax policy“, the sentence appears in the context of a geographical mobile tax base (p.10) and is followed by the insight that a too high downward pressure on tax rates eventually would lead to a too low governmental revenue raised. Moreover, after having identified several efficiency problems with high tax rates, the OECD states that the main objective has to be to minimize distortions while governments still are able to raise the needed funds, and points out, that threats like a mobile tax base rather have to be faced by international coherent practices. The OECD is concerned that „It is increasingly difficult for individual countries to manage their tax bases in the face of these forces and, in particular, some tax practices have led to harmful and distorted cross-border ‘tax competition’“ (p.13). So, I would definitely not say, that the OECD now is in favor of tax havens or tax laws that are harming other countries in raising the revenue that is needed. The statement that tax havens „promote good policy around the world“, I have to comment on. Tax competition may be good in a model set-up of Leviathan governments as they would lead to a more disciplined usage tax revenues. However, political accountability is worsened, and hence, the overall effect is ambiguous. And how to define good policy? Ain’t it be the case that tax rates are set in such a way that they generate the country specific revenue income? Because, I would claim, that this revenue level is distinct in every nation, depending on the coverage and degree of social services provided by the state and the demographic composition, implicitly being a reason for why tax rates never will nor shall be the same. Also the claim that „tax havens generate high living standards. Grow faster and create more prosperity“ was proofed wrong with the case of Cyprus. One general remark on tax evasion – the illegal form of tax avoidance – which I do conceptualize with tax havens, not tax competition: At the time, there is a debate going on in Germany on the legal treatment of tax evaders that report themselves to fiscal authorities. Having in mind that one aim of taxes is to redistribute income between groups – fairness in society – I do not see any benefit for the global economy, welfare or equity improvements when better-off individuals park their money in Switzerland. Cause the milliards of euros that are hidden from the fiscus thus have to be generated by the rest of the population – to call it a peccadillo is just outrageous. Categories: Economics, Taxes | Tags: public economics | Permalink. With “Taxing Job Creators”1, he picks up the dispute of Democrats and Republicans when it comes regarding taxation of top-earners. Reading through the comments left me in total confusion – Is it possible that a Nobel Prize winner is missing points of Economics 101? Not few did criticize him, and yet, though hidden in a camouflaged mocking of conservatives, he has a point, and an important one, I would claim. Krugman, being a liberal himself, is focusing on the political arguments of rightists; two common ones (expropriation and responses at the intensive margin) he considers as being dull, but the last – “You’ll kill job creation!” – seems interesting to him. He argues, by referring to a paper of Diamond and Saez (D&S), that the marginal tax rate at the top should lie around 70% – but the main purpose of the short article is to challenge the conservatives’ justification of keeping the tax rates low: claiming their arguments to be rooted in the concepts of free-markets, he argues, is ignorant, since it is not embedded in the theory at all. Indeed, his last sentence does capture his point perfectly: “Even if you believe that the top 1% or better yet the top 0.1% are actually earning the money they make, what they contribute is what they get, and they deserve no special solicitude.” Meaning, that what they create already is measured by what they contribute to GDP – the rich are not the job-creators, and for that reason they should not be treated differently; the reasoning behind is easily grasped: there is no direct income effect on other individuals when you choose to work one hour more or less. And this is always true. Many did attack Krugman for not taking into account multiplier effects, but I think they are not relevant for what he is trying to tell us. Even though the rich do send a bigger paycheck to the government, at the margin, any person of any income group, is equalizing benefits and costs. So, the principles of free-markets can never justify subsidization (= lower marginal taxes). Recall, the real effect is caused by an eminent substitution effect at the kink of the budget constraint where a higher marginal tax rate causes government revenues to shrink. 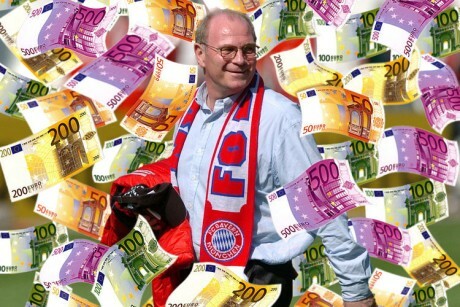 However, the effect is assumed to be quite low for the top of the top, implying that overall revenues will increase. Taxation is the government’s tool to redistribute, and if it really is like D&S suggest – 1$ to the government contributes more to society’s welfare than if that dollar is consumed by a top-earner – there is no plausible reason to not try to maximize the revenue that can be collected from that group. The only constraint is set by balancing the trade-off of marginal gains in revenue and rising distortion due to taxation2. To close the circle, exactly that trade-off is why the optimal tax-rate on high incomes should be lower than 100% – but, there is no space for arguments totally unconnected with basic theory of public economics. Among all the government’s revenue sources available, taxes are definitely the most effective one. This explains the straight relation between economies with high level of public debt (such as Portugal nowadays) and taxes increase policies. However, do all taxes provide the same government revenue? Are consumer’s welfare modified in the same way for all kind of taxes? This post’s purpose is to clarify these questions. In order to guarantee the validity of the reasoning that will be presented, some microeconomic conditions must be verified. First, the argument was based on the idea that individuals behave rationally, that is, consumers are able to choose the combination of goods which provides them the highest level of welfare. One immediate implication of rationality is that consumers know the exact amount of money that they are willingness to save and spend every period. Second, it is required to ensure that consumers prefer to expend their income with small quantities of several goods than only consume large quantities of few of them (in microeconomics, it is stated that individuals hold “convex preferences”). Third, individually, consumers do not have bargain power for negotiate the price of the goods. Finally, the taxation system works perfectly: consumers know clearly the amount of taxes they must pay and they take it into account when deciding how to allocate their income. It is possible to observe that governments rely on two sorts of taxation: the direct and the indirect. The first type is characterized by the immediate transfer from economic agent to the government, without intermediation of any other agent. It is the case of the income, patrimony and heritage taxes, for instance. Presumably, indirect taxes are observed when transaction costs for transferring resources to the government are involved. In Portugal some examples of these duties are the value added tax, the tobacco tax and the stamp tax. It is desirable to analyze, first, the impact of an indirect tax applied to specific good of the economy, say cigarette. On the one hand, everything else held constant, smokers’ welfare may be diminished, since it is expected that they will opt to buy less quantities of cigarette, due to the fact that its price is relatively higher comparing to all other good – that is why economists state that these taxes create distortions in relative prices. On the other hand, government will acquire tax revenue which is given by R=tx, where t represents the amount per unit of cigarette and x, the amount of the good purchased after the tax implementation. Now, we will assume that the government imposes a direct tax – an income tax for instance – in such way that the amount of revenue generated is R, as described in the previously. In this circumstance, consumers will have less income available to spend, however no distortion in relative prices will be established. These types of taxes are known in the economic literature as Lump-Sum taxes. Therefore, in one case a tax applied to a given good reduces consumer’s purchase power, leading to a distortion of his or her choices. In the other, an income tax allows the individual to decide how to allocate his or her remaining wealth. Considering both situation, which one is less harmful for the economy? Through the use of microeconomics tools, we can ensure that Lump-Sum taxes can provide the same amount of government revenues, but enables consumers to achieve a better level of welfare. Resorting to the economic jargon, we can state that taxes of the type Lump-Sum eliminate the excess of tax burden existing in taxation of a specific good. There is no doubt that, either direct or indirect taxes, lead to a decrease in consumer’s welfare. However, repute that they are equally hurtful for economic agents must be consider a misconception. Governments should decrease indirect taxes an increase income tax in order to let consumers better allocate resources. Categories: Microeconomic Policy Analysis, Taxes | Permalink. Currently in Portugal we all know government has to reduce the fiscal deficit, that’s something taken as given (the end). What we don’t know is the best way to achieve it (the means). The ways to achieve a given outcome are based on political decisions, we might reach the agreed budget deficits by cutting more expenditures, putting more efforts on economic growth or increasing taxes. This article focuses on the latter. When we talk about taxes’ increases too criteria come: efficiency, equity. Efficiency relates to social welfare that is lost by imposing a tax and equity is how spread is the cost or loss coming from a tax among economic agents. Regarding efficiency, taxes as VAT, that have a direct impact on markets (supply and demand of a given product), originate distortions and these distortions are the loss of efficiency or welfare by introducing a tax. Basically they are measured as the difference between the quantity the market wants to consume of a given product (aggregate demand) and the quantity actually consumed due to the tax (VAT will increase price paid by the final consumer so the quantity demanded is expected to be lower). In economic terms there is a deadweight loss (DWL) – transactions that have an economic value could have taken place if it wasn’t the tax in place. The key question now is to know what determines the extent of the DWL? The amount of the distortion is determined by the tax increase and the variation in the quantity demanded. This means that for the same tax rate the distortion is higher for larger price elastic products, i.e. when consumers are more sensitive to prices imposing a tax (which is the same of saying the consumer pays more for each unit) will result in a bigger wedge between the desired and the actual quantity demanded. For the same tax rate (and let’s assume for the same government revenue, i.e. the quantities on both graphs are equal to generate the same revenue t*Q), we are better off by taxing the inelastic good. If we need to tax (as the Portuguese case mirrors), we ought to tax more inelastic markets, where distortions will be lower. Take this small model to the Portuguese reality. For my surprise last week, when I was travelling from Coimbra to Lisbon by bus, the VAT charged was 6%. The government budget for 2012 predicted a VAT increase to 23% on restaurants and cafés (increased 10pp). Was this the best political choice? First the financial argument, second the economic argument. Let’s assume the government needs a given revenue (say T). In order to get T, government will impose a tax (t) on the market price which will affect the quantity consumed. The larger the market, the same tax (t) yields higher revenue. According to Portuguese Statistical Bureau (INE) the gross-added value for transports and restaurants was 3,464 and 1,8 billion € (American billions) in 2004. To get T government will need a lower tax (t) on transports compared to restaurants and cafés. If this is so the distortion caused is lower. 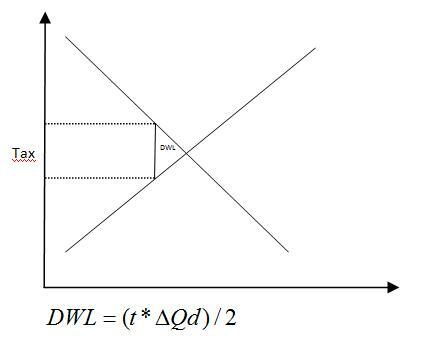 Furthermore from the economic view, we have different price elasticities for both goods. Fouquet (2012) estimates an elasticity of -0,6 for transports and Anderson et al. (1997) -2,3 for restaurants. Transportation is more inelastic than restaurants meaning that if VAT had increased on transports instead of restaurants, the distortions and inefficiencies would have been lower. When the analysis seems to be more macro it might be the case where the answers are on the micro details. The government needs to save, however if it can save causing less inefficiencies the better for the society and for government itself, because inefficiency means loss in GDP. Barómetro, Departamento Económico e Estudos, edição nº 2, 2007. VAT increase on restaurants and rising of imports? Recently, having a light lunch with my wife and kids at a nice spot, Mr. Carlos the place owner whom I have known for a while, was complaining about the VAT increase on restaurants. He argued ironically that his clients would rather buy a better TV than to pay more to eat at his place. Indeed Mr. Carlos intuition was not far from right. VAT on TVs remaining constant, a VAT increase on restaurants fully reflected on meal prices would cause a relative price increase of the menu list and a possible consequent substitution effect between meals at restaurants and the consumption of other goods (all other things equal). Mr. Carlos understood the argument but reacted with a smile: His clients were financially in a worse situation than before the crisis, but still not at the edge of a cliff. They would not accept to feel worse because of what was happening in the restaurant business. His clients would certainly try to find a compensation elsewhere to the fact of restaurants being more expensive: they would find alternative ways to adjust their spending behavior in order to feel as well of: For Mr. Carlos “the new TV was certainly going to be bought” after all, but his business might not survive the reduction in the number of clients, meals, and average sale per customer. For Mr. Carlos, worse than the national crisis was the perception created that the prices in restaurants have increased much more than the prices of other goods. He thinks that the substitution of consumption between restaurants and other goods had a much greater negative impact for him than the general decrease in income Portuguese people are facing in general. Furthermore he thinks that his clients in particular suffer less than the average people with the crisis. He has no doubts that this policy measure is causing not only a huge increase in unemployment in his activity, but also may be contributing to rising imports by promoting a certain level of substitution between meals in restaurants and the consumption of other goods.